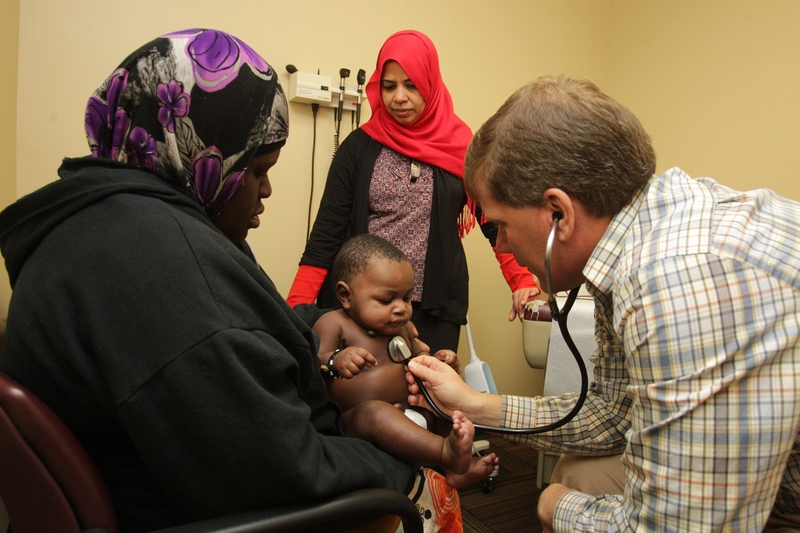 Dr. Myron Glick, at top, examines Urahimu Osman, 4 months, son of Bahati Mberwa of Somalia. Watching in the background is interpreter Zahra Mohamed. Below left, medical assistant and translator Aung Sa Lay measures 11-year-old Lay Mya Aye during a physical. And right, Larsay Wah, a refugee from Burma who moved to Buffalo in 2009, waits with her daughters, Larhekpaw Say, 11, left, and Silver Moo, 20 months. Dr. Myron Glick, who hails from a traditional Amish community in Lancaster, Pa., planned long ago to be a medical missionary. He spent 11 years of his childhood in Belize, a small country in Central America, where his father served as a Mennonite pastor. Helping the poor was part of his upbringing. It didn’t quite work out the way he planned. After finishing medical school at the University at Buffalo, Glick and his wife, Joyce, started a family, with four children now ages 12 to 22, and opened a family practice catering to low-income people on the West Side. But as fate – or, the Glicks might say, a higher order – would have it, the world’s needy came to them. From war-torn and poverty-stricken countries in East and West Africa to Southeast Asia and the Middle East, newly minted refugees on the West Side – the fastest growing population in Buffalo and Erie County – found their way to the Glicks’ doorstep. What the Glicks, their co-workers and supporters have created for the new arrivals is more than they could have done overseas – and without ever having to get on an airplane. “The whole motivation for being here is really out of our faith, and this belief that if Jesus was a doctor now, here, that he would be upset by the injustice in the health system and he would especially reach out to the poor and the most vulnerable. That’s the heart of why we do what we do,” Glick said. The atmosphere inside Jericho Road Community Health Center – a two-story brick building with a concrete addition at 184 Barton St., in a racially and culturally diverse neighborhood – has little in common with the sterile, corporatelike atmosphere common to large medical institutions. There is a palpable warmth and cheerful informality doctors and staff demonstrate with their patients, and to each other. Something else unusual and telling is posted on the reception window: “Jericho Road Community Health Center serves all patients regardless of inability to pay. Discounts for services are offered, depending on family size and income,” the information sheet begins. The message is translated in 12 languages – Arabic, Burmese, Karen, Somali, Spanish, Nepali, Swahili, Vietnamese, French, Karenni, Tigrinya and Amharic. These are the most common languages heard at the health center, but dozens of other native tongues have been spoken from all corners of the globe, where people have often left brutal governments and squalid refugee camps behind. That’s in addition to a multitude of dialects that can pose challenges for even the most seasoned translators. The need for Jericho Road is great: About 90 percent of the city’s refugees – with the largest numbers coming from people with roots in Burma, Nepal and Somalia – have been streaming into the West Side. They come in at a rate of about 1,300 a year. Another 500 arrive from other locations in the United States, according to the International Institute of Buffalo, one of four resettlement agencies along with Jewish Family Service of Buffalo and Erie County, Catholic Charities and Journey’s End Refugee Services. All work with Jericho Road to develop ongoing services for immigrants and refugees, and appreciate the health center’s efforts. “Jericho Road Community Health Center is a stunning example of people who work with their hearts and minds for the benefit of others,” said Eva Hassett, who heads the International Institute of Buffalo. “Jericho Road does great work. They are committed to immigrants and refugees in the community,” said Marlene Schillinger, Jewish Family Service’s chief executive officer. When Jericho Road Family Practice began 17 years ago with Glick as its sole doctor, a mother and two children were the only patients to come in during that first, unspectacular week. Now, the annual budget is around $6 million, and close to 1,000 patients come through the door each week – many living below the federal poverty line. Fifty to 60 percent of the patients can’t speak English. Seventy percent are on Medicaid and most are children, since almost 80 percent of the refugees entering Buffalo are 12 and under. About half of the patients are low-income native Buffalonians. Jericho Road employs 100 employees at the health center, including six doctors and eight nurse practitioners. It also operates a second site at 1609 Genesee St., on the East Side, where among its patients are Islamic Burmese that live nearby. Jericho Road also partners with VIVE to give medical care to refugees seeking asylum in the U.S. and Canada. Sensitivity to patients is foremost. “Our staff reflects the people we serve. The cool thing about the translators is not only do they interpret the language for us, but they interpret the culture. They become brokers of the culture. It helps us to be sensitive to not just the language but what they really mean,” Glick said. Jericho Road also operates eight community development programs which, Glick said, go after the “social determinants” of health. They range from a refugee drop-in center three blocks from the medical center and an after-school program for middle school refugee children, to at-home mentoring programs for refugee mothers pregnant in the U.S. for the first time, and one to help young parents that includes new toys and books. The programs, which employ 60 people, are meant to sustain refugees after their intensive six-month relationship with resettlement agencies ends. That’s often not enough time for people who may be dealing with trauma and fear, and are not yet equipped to adjust to a culture, language and education system so vastly different from anything they’ve experienced. Jericho Road also provides a spiritual component. While Christian, it is committed to helping people pray and to serve patients’ spiritual needs regardless of religious affiliation. With 75 families on a waiting list, the demand for medical and other services is great. “Every day I get calls from other agencies that have urgent needs and want to know if we can help them out,” said Joyce Glick, who is the front office manager for medical services. Jericho Road was recently named a Federally Qualified Community Health Center under the Affordable Care Act, and that designation – it’s no longer a private practice – should make substantially more resources available, including larger reimbursements for Medicaid and the uninsured. Think “My son, the doctor,” and add a Yiddish accent. That wasn’t Myron Glick’s experience. Choosing medicine wasn’t an easy path. No one from his insular Amish community went to high school, let alone college, so deciding to do so was akin to rejecting his background. The transition was a difficult one, Glick said, although his family came to be supportive. Glick, 48, went to Houghton College, and studied medicine at the University at Buffalo. What he saw as a medical student doing his residency in poor neighborhoods disturbed him. “I didn’t grow up in this culture, and was pretty sheltered living in the Mennonite communities from the way the poor were treated,” Glick said. It extended from such things as the lack of appointment times and the long waits to the likelihood that people without insurance, or on Medicaid, wouldn’t see the same physician, or would be passed along to medical students or resident physicians. “Too often in the health care system we have today, there is a very cynical attitude about the poor. As a medical student you felt frustrated because you went into medical school to help people, and yet what’s being modeled really isn’t good care,” he said. Glick has constructed a philosophy at Jericho Road different from what he said he was exposed to. Glick is frequently frustrated by the lack of equal treatment he sees. A conversation with a cardiologist that he hoped would treat one of his patients was one of several examples that quickly came to mind. Jericho Road is an unusually hands-on medical operation that began to switch to electronic medical records 10 years ago to save money, does its own billing and is able to maintain a good show rate. It’s Glick’s hope that others will learn and possibly emulate the successful financial model Jericho Road has created despite a low-income patient base. Dr. David Holmes, a family physician who serves on Jericho Road’s board and directs Global Health Education at University at Buffalo’s Department of Family Medicine, said he’s pondered what makes Jericho Road, where doctors are paid less than at other medical facilities, such a gratifying place to work. “Why is there so much staff satisfaction at Jericho Road, and doctor satisfaction, and I assume patient satisfaction? I think it’s because there is a real spirit of unity and sense of a deeper mission, that you’re not just there for a paycheck. I think at some of the other clinics, they’re there to help people, but they’re also there because it’s a job,” Holmes said. Translator Han Moe is Karen, a minority population in Burma, and was one of the first Burmese to settle in Buffalo in 2000. A former truck mechanic and Navy veteran, including a stint in Iraq, he translated on a recent day for Larsay Wah and her daughter Larhekpaw Say, who was receiving a scheduled pediatric shot. Thein Thein and her daughter, Laymya Aye, 11, also Burmese, were in another examining room, where the girl was waiting to tell nurse practitioner Heather Quinn of dizziness. “The doctors are really friendly, and we don’t have to worry about language because they have translators here,” Lae said. For Quinn, practicing medicine at Jericho Road has been a life-altering experience. “I grew up not very cultured, if you will – suburbs, upper middle class near Rochester. When I came here, I don’t know what it was, but it fulfilled something in me. I felt God really leading me to this place,” Quinn said. The line forms early at the Hope Refugee Drop-In Center by the time the doors open at 8:30 a.m. on the three drop-in days a week. Inside, it doesn’t take long for the seven work spaces to hum with activity, while a kaleidoscope of nationalities sit patiently in the waiting room. Help obtaining a green card, making an appointment to see a medical specialist, trying to understand what a credit card is and why an application arrived in the mail were among the issues tackled by case workers, including AmeriCorps volunteers, on a recent day. “A lot of our clients haven’t even had to deal with a monetary system before, so to have these pieces of paper come to your house with amounts that you have to pay and to figure out for the first time can be very daunting,” said Jen Heavener, an AmeriCorps volunteer. Nazret Kotu, an Eritrean who gave her age as 27 or 28 – complicating matters, many refugees don’t celebrate birthdays or share last names – was getting help for her 7-year-old son who was born deaf. A caseworker was trying to get him enrolled in St. Mary’s School for the Deaf, and addressing the boy’s beating by a relative. Kotu and her five children moved to Buffalo from South Dakota, where people from her Kunama tribe lived, to be near a sister. She had been in a refugee camp for eight years prior to that. “This agency has been so helpful for me, in anything that I need. I am so grateful,” Kotu said with the help of an interpreter. Anna Ireland, who oversees the drop-in center, said 120 to 150 people come in on average, 40 to 50 on non-drop-in days. It turns out the Glicks will be overseas medical missionaries after all: Jericho Road is opening a clinic in war-torn Sierra Leone, where one in four children die before age 5 and life expectancy is 45. Jericho Road’s following the lead of a nurse who returned to her country and suggested the health center get involved. Some $100,000 was raised last year, and a May 22 fundraiser is planned at Pearl Street Grill. That’s in addition to a June 15 5K run fundraiser on the West Side to benefit the health center. “We feel like we are medical missionaries here, so the clinic in Sierra Leone is an extension of that,” said Paul Violanti, a nurse practitioner and founding board member. He reflected for a moment on Jericho Road’s early days, when snow formed inside some rooms now used by doctors.